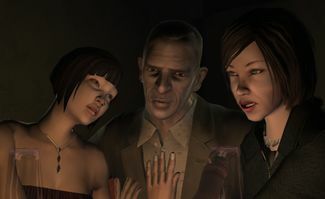 Katerina and Vera alongside Mikhail Faustin (center) in the opening cutscene of "Final Destination" in GTA IV. Katerina and Vera are two minor one-shot characters featured very briefly in Grand Theft Auto IV. They serve solely as dressing in the opening cutscene of "Final Destination", accompanying Mikhail Faustin at Perestroika just as the player and Dimitri Rascalov arrive to provide distressing information. The two women are then instructed by Mikhail to move out of the table to make room for the player and Dimitri, and are never seen again. Although their names are mentioned in the cutscene, it is not known which of the two is Katerina or Vera. Poppy Mitchell (a character in The Ballad of Gay Tony) and Shirley share a similar character model set (F_Y_CDRESS_01) as one of the two women. This page was last modified on 26 October 2013, at 15:46.